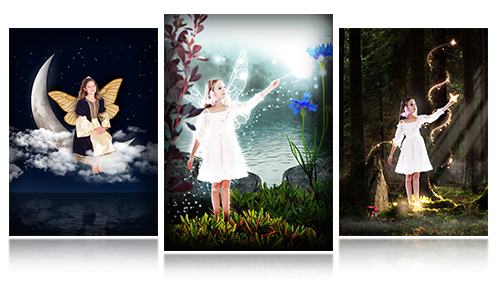 During fairy tale photo shoots, kids dress up in a flowing fairy dress or woodland-warrior costume complete with shimmering wings and strike impish poses. Afterward, families will view the results and select the pose they like best to be printed and turned into a digital image. Processing-lab technicians and graphic artists will then add a digital background and magical effects to the chosen pose, creating an otherworldly forest scene.